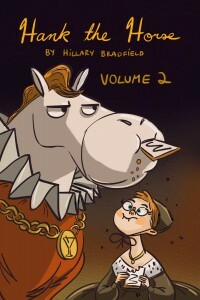 Hillary Bradfield describes herself as an animator, comic creator, and storyboard artist. Most recently she’s spent her time working on Disney XD’s Randy Cunningham, 9th Grade Ninja. On her own though, she’s created a comic strip adventure called Hank the Horse over on her blogspot. Follow the adventures of a cranky equine as he’s dragged along on a wild adventure by a young lady — who happens to look a lot like Hillary draws herself. Some of her Hank comics have been collected on dead trees as well, and Volumes 1 & 2 are available on her blogspot also.